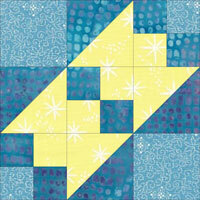 The Jacob's Ladder quilt block is characterized by strong diagonal lines running in both directions through the block. 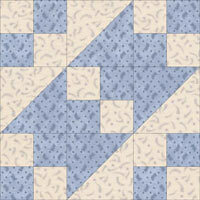 Four patches fill the corners and center of this variation on a nine-patch pattern, with half square triangles completing the design. 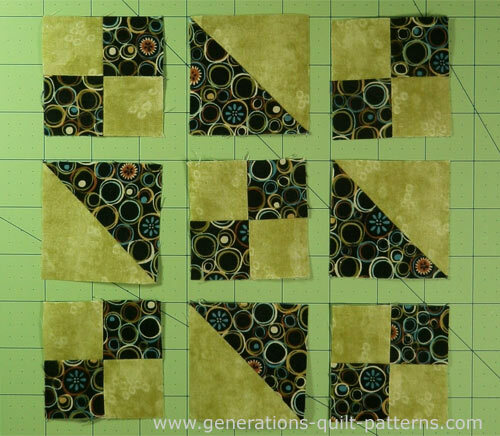 Further below you'll find cutting instructions for 5 block sizes, 8 variations based on this patchwork design, and finally a look at a few other blocks that carry the 'Jacob's Ladder' moniker. 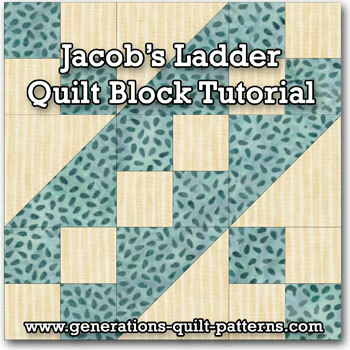 Visit our page Jacob's Ladder Quilt Design and scroll down to the 3x3 Grid section to jump start your idea factory on what to do with all the blocks you'll make. Let's get to our Jacob's Ladder! All seam allowances (SA) are 1/4". When you are instructed to press, first press the pieced unit flat to set the seam. Then open the patch, pressing from the front. Seam allowances are pressed to the dark fabric unless otherwise noted. Patches for the half square triangles are marked with '**'. I prefer to make my HSTs larger and trim them down to the actual size after stitching. 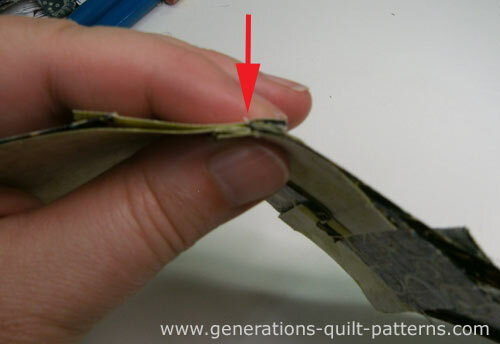 The Quick Piecing method is used to make them. There is a chart further down in these instructions where you need it for trimming them to size. 1**	 L 2	 2⅜"	x	2⅜"	 2⅞"	x	2⅞"	 3⅜"	x	3⅜"	 3⅞"	x	3⅞"	 4⅞"	x	⅞"
2**	 D	 2	 2⅜"	x	2⅜"	 2⅞"	x	2⅞"	 3⅜"	x	3⅜"	 3⅞"	x	3⅞"	 ⅞"	x	⅞"
3	 L	 1	 1¼"	x	13½"	 1½"	x	16"	 1¾"	x	18½"	 2"	x	21"	 2½"	x	26"
4	 D 1	 1¼"	x	13½"	 1½"	x	16"	 1¾"	x	18½"	 2"	x	21"	 2½"	x	26"
Unfinished Block Size	 5"	 6½"	 8"	 9½"	 12½"
Grid Size	 ¾"	 1"	 1¼"	 1½"	 2"
Learn more about my favorite, new quilting tool, the Magic Pressing Mat. A valuable addition to your quilting tools—regardless of the piecing technique you use. Our Jacob's Ladder needs four HSTs. 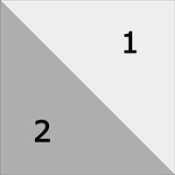 With a pencil, draw a diagonal line on the back side of the two #1 squares. With RST, layer one marked light square with one dark #2 square. Stitch a quarter inch away from the drawn line on both sides. Repeat for the second pair of squares. 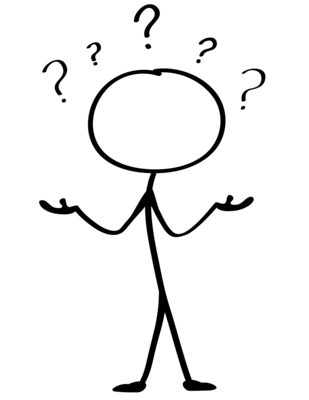 Arrow points to anchor cloth. 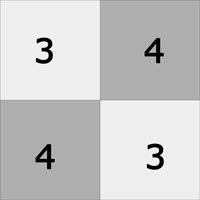 Cut on the drawn line to create two units from each pair of squares. These are your trimmed units. For more detailed information on this HST-technique, click here. 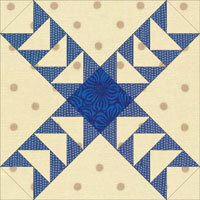 Our Jacob's Ladder quilt block needs a total of five 4 patch units. With RST, align the edges of the light and dark strips. Stitch the long edge with a quarter inch seam. With your rotary cutter, straighten one short edge of this strip set. Now cut it into ten 1-1/2" segments that look like this. 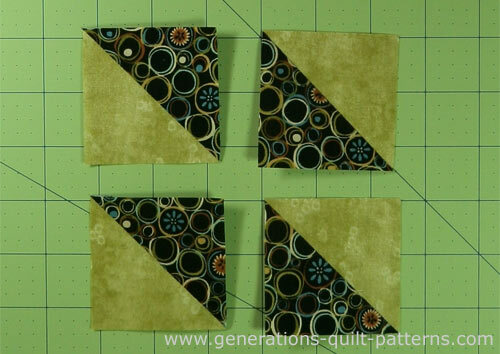 For this 6" finished sample each segment measures 1-1/2" x 2-1/2"
Alternating light and dark fabrics, stitch pairs of these segments together to create five 4-patches that measure 2-1/2" square. 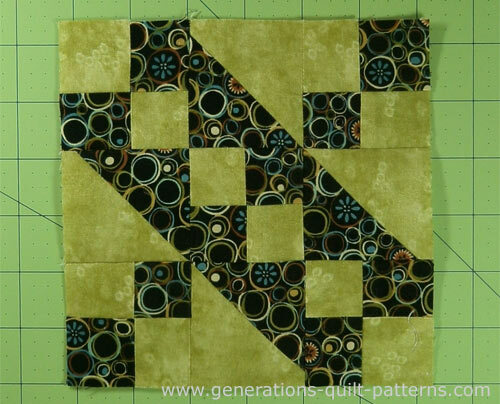 To reduce bulk at the center of a four patch, I like to twirl or pinwheel the seam allowance. It looks like this (below, right). Lay out your sewn units in rows. It is REALLY easy to get the patches discombobulated! (Ask me how I know!) Just remember that the triangle squares border the light diagonal chain of squares. Stitch the patches into rows. 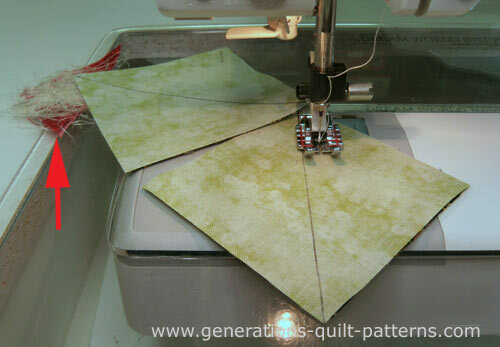 You can press in either direction—towards the 4-patches or towards the HSTs—just be consistent. That way your seams will nest which makes matching them so much easier. Stitch the rows together. 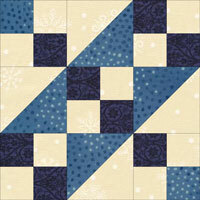 After a final press your Jacob's Ladder quilt block looks like this. You've learned just how simple this design is to make. 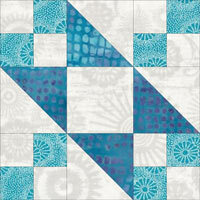 Click here to find layout ideas for the Jacob's Ladder block to spur your creativity! 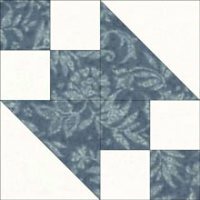 Play with the number of fabrics and the units and you've got a multitude of Jacob's Ladder quilt block based patterns at your fingertips. A third fabric is added that changes the color placement. 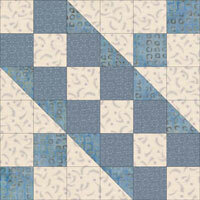 Two of the corner four patches are replace with solid squares. The second diagonal disappears when this block is set edge to edge. The center four patch is replaced with a solid square. Back to the two fabric block, four patches are changed or removed. Click here for instructions to make this variation. The second diagonal is completely gone. Also known as Pacific Rail Road or Road to Arkansas. 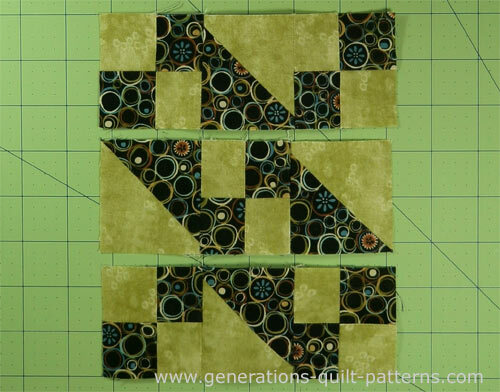 Click here for instructions to make this block. In these next variations, the half square triangles are inline with the dark diagonal chain and form, well, 'bats' for lack of a better word. Still the exact same units as the original Jacob's Ladder, just rotated for a totally different looking block. Corner 4-patches are gone. Three fabrics. This block is also called Road to the White House. The block drawn on a 2x2 grid instead of our 3x3. 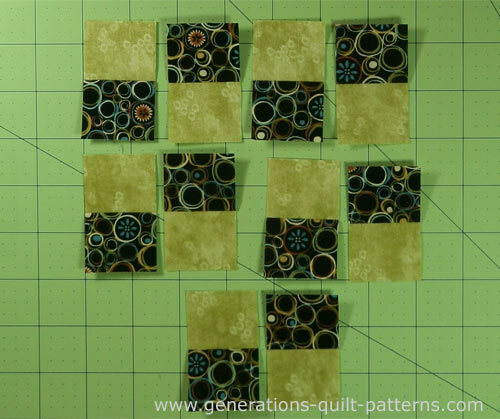 Great for scrap quilts! Also know as: Double Four Patch, Gay Scrap Quilt, Going to Chicago, New Four Patch, Railroad, Railroad Crossing and World's Fair. 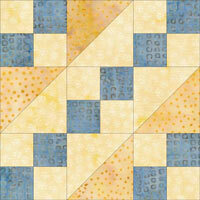 I've found three 3x3 grid blocks that are also named 'Jacob's Ladder quilt block'. The first two look like variations of the same idea--more like a 'Wild Goose Chase' in my humble opinion. This third one mimics the feel of the original Jacob's Ladder with the same strong diagonal line, but it is accomplished with smaller triangle squares. A wee bit more scrap friendly because the patches are smaller. 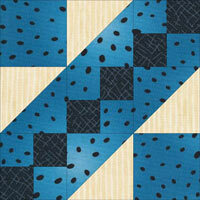 Climb the ladder to quilting success! 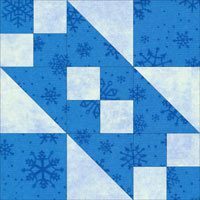 Just check out our Free Quilt Block Pattern Library to find more blocks for your next quilt project! Step by step and you'll be finished in no time! There's also a Jacob's Ladder children's toy in the list below. 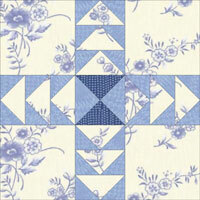 It'd be fun to include it with their new quilt, don't you think?! Wouldn't this make a cute quilt for your favorite binge-watcher? What if you replaced the blank screens with photo transfers of favorite family pics? ...as chosen by our readers.